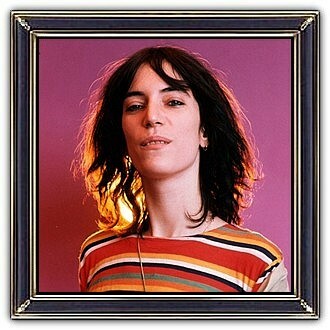 Patricia Lee "Patti" Smith (born December 30, 1946) is an American singer-songwriter, poet, and visual artist. By 1974, Patti Smith was performing rock music, initially with guitarist, bassist and rock archivist Lenny Kaye, and later with a full band comprising Kaye, Ivan Kral (guitar & bass), Jay Dee Daugherty (drums) and Richard Sohl (piano). Smith became an influential component of the New York City punk rock movement with her 1975 debut album Horses. Smith fused rock and poetry in her work. Her most widely known song is Because the Night, which was co-written with Bruce Springsteen. In 2005, Patti Smith was named a Commander of the Ordre des Arts et des Lettres by the French Ministry of Culture. In 2007, she was inducted into the Rock and Roll Hall of Fame.